Transatlantic Brethren recreates the Atlantic community of Baptists in Britain and America by focusing on the correspondence and connections of the Rev. Samuel Jones of Pennepek, near Philadelphia. Themes such as shared news of gospel success, the development of Baptist associations, and a learned ministry made for meaningful, if not always harmonious, communication between Baptists on both sides of the Atlantic during the eighteenth century. In 1735, Samuel Jones was born in Wales, a nation within the British Isles with its own distinctive history, language, and culture. As a child he arrived in Pennsylvania. His father, who settled at Tulpehocken in Berks County, Pennsylvania, was one of a long line of Welsh Baptist ministers who came to the Delaware Valley during the early years of the eighteenth century. The Welsh Baptists contributed toward the mainstream development of Baptist denominational order in the Delaware Valley and did so at the partial expense of their own distinctive ethnic identity. After mid-century, as a function of growth and assimilation, the Welsh language was not so widely used as a language of public worship in the Valley, but a knowledge of Welsh and a memory of Wales was retained in a few communities, such as Tulpehocken and the Welsh Tract in Newcastle County, Delaware. This was the inheritance of Samuel Jones. He became one of the leading figures of the Philadelphia Baptist Association and was admired throughout Baptist America for his scholarship, acumen, and Calvinist orthodoxy. After the American Revolution, Jones, like many other leading American Baptists, corresponded with Baptists in England and Wales. One of the reasons for this correspondence was a self-conscious attempt to reconcile fellow Baptists after the political divisions of war. Differences were suppressed to foster transatlantic Baptist fellowship. 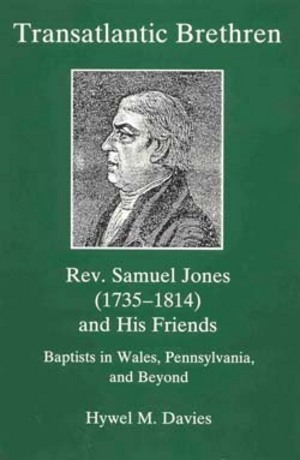 Jones's connections with Baptists in Wales were particularly intimate, since he was tied by bonds of kinship as well as fellowship to "our brethren in [my] native country." This kinship was not only a historical inheritance, but also a historical product of his correspondence with Joshua Thomas, the historian of the Welsh Baptists, during the 1780s. These connections broadened during the French Revolution to become a vehicle of emigration for disaffected Welsh Baptists and other dissenters, who were attracted to America as the Land of Liberty. Jones, a proud American and a beneficiary of emigration himself, encouraged this emigration and offered the sale of land. Samuel Jones nurtured a "peculiar regard" for the Welsh because of his own self-identity as a Welshman.